Sticky Password Premium is a powerful security application that lets you safely store passwords in the cloud so you can access them from anywhere. 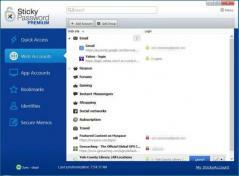 At first run, you will need to create an online account so you can access your saved password via the cloud. You will also be prompted to create a master password which you will need to use to access the application. Sticky Password runs in the system tray and supports various popular web browsers such as Chrome, Firefox and Internet Explorer which can be monitored for saving login credentials. You can also add and store secure memos, web and app accounts, as well as identity data for auto-fill in your web browser. Management options of Sticky Password allow you to organize your web and application accounts into preset categories as well as custom ones. It’s also possible to create a list of favorites, use the built-in search, and lock the tool while your computer is unattended.